The Castelli Core 2 W tri short black women have everything you need in a Triathlon, the fast drying/highly supportive Pace3 fabric. This tri short offers a lot of comfort and aerodynamics because it is developed with a lie-flat elastic. Tip: keep in mind that the Castelli clothing fits smaller than normal. 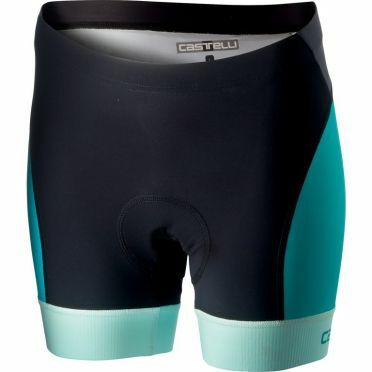 The Castelli Free W short short black/green women is for the triathlete who wants a skimpier short. 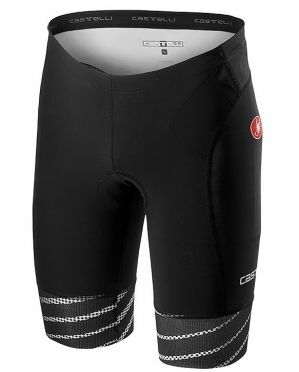 Castelli lowered the waist and shortened the legs, relative to the Free W tri short. Tip: keep in mind that the Castelli clothing fits smaller than normal. 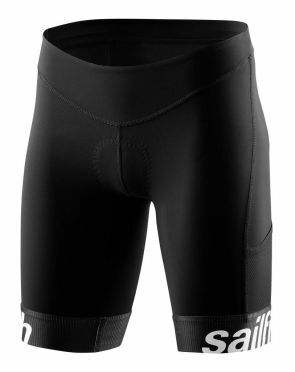 The Castelli Free tri short black/black men is perfect in combination with the Free Tri Top and boosts your performance during the triathlon. De Instadry Speed Fabric is fast in the swim and doesn't absorb water. Features Castelli's new Tri Kiss seat pad for comfort on the bike that all but disappears on the swim and run. Other features are the GIRO3 Gripper elastic, the drawcord waist and Flatlock stitching. Tip: keep in mind that the Castelli clothing fits smaller than normal. 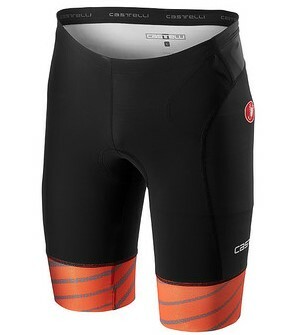 The Castelli Free tri short black/orange men is perfect in combination with the Free Tri Top and boosts your performance during the triathlon. De Instadry Speed Fabric is fast in the swim and doesn't absorb water. Features Castelli's new Tri Kiss seat pad for comfort on the bike that all but disappears on the swim and run. Other features are the GIRO3 Gripper elastic, the drawcord waist and Flatlock stitching. Tip: keep in mind that the Castelli clothing fits smaller than normal. The 2XU Active 7" tri shorts black women features 70-denier SBR Skin Lite fabrication on the legs for muscle support and durability. 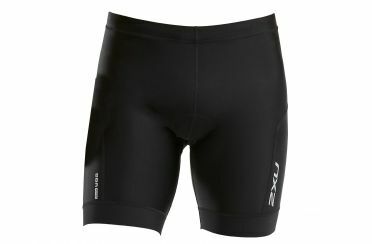 This popular shorts also features 2XU's Speedline Chamois for essential padding in a seriously subtle execution. The 2XU Active tri shorts is built for exceptional comfort and durability. 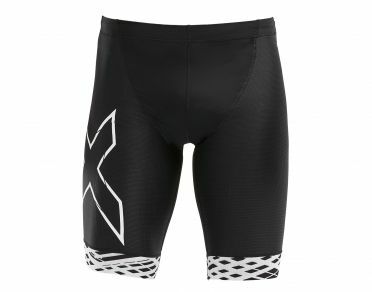 The 2XU Perform 7" tri shorts black women delivers the advanced support required to conquer the rigors of triathlon. SBR Power is built to control muscle stabilization and support your lower body for unmatched power and durability, while our exclusive LD Chamois provides essential cushioning for the ride, but a discreet feel on the run. Sensor Mesh X zoned paneling delivers vital moisture management and air ow management, affirming that this garment is built for all-round performance across short and long course racing. 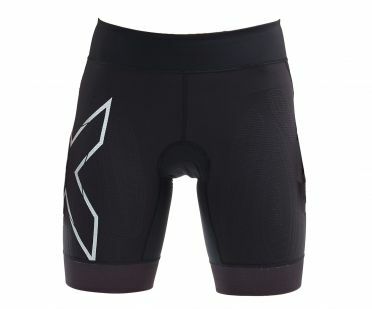 The 2XU Perform 4.5" tri shorts black women delivers the advanced support required to conquer the rigors of triathlon. SBR Power is built to control muscle stabilization and support your lower body for unmatched power and durability, while our exclusive LD Chamois provides essential cushioning for the ride, but a discreet feel on the run. Sensor Mesh X zoned paneling delivers vital moisture management and air ow management, affirming that this garment is built for all-round performance across short and long course racing. Completely redesigned in accordance with 2XU’s latest RMIT University research, the 2XU Compression tri shorts black women promises superior ventilation and power. PWX 105D Power Mesh fabrication with muscle mapping ensures muscle stabilization for greater power output on the bike and the run, while muscle oscillation support reduces fatigue for greater endurance. 2XU's exclusive Pro LD Chamois provides essential cushioning for the ride, but a discreet feel on the run. This range promotes endurance and provides protection against the challenges of long course racing; injury, fatigue, heat and the sun. The 2XU Active tri shorts black men features 70-denier SBR Skin Lite fabrication on the legs for muscle support and durability. 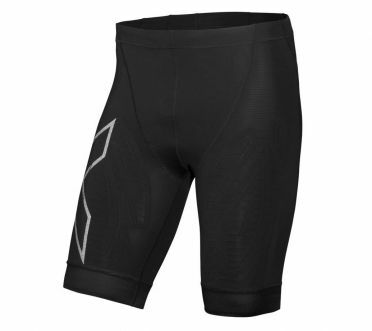 This popular shorts also features 2XU's Speedline Chamois for essential padding in a seriously subtle execution. The 2XU Active tri shorts is built for exceptional comfort and durability. 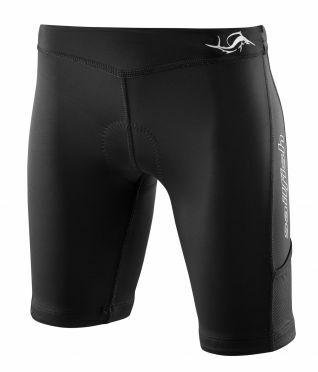 The 2XU Perform 7" tri shorts black men delivers the advanced support required to conquer the rigors of triathlon. SBR POWER is built to control muscle stabilization and support your lower body for unmatched power and durability, while our exclusive LD CHAMOIS provides essential cushioning for the ride, but a discreet feel on the run. SENSOR MESH X zoned paneling delivers vital moisture management and air ow management, affirming that this garment is built for all-round performance across short and long course racing. The 2XU Perform 9" tri shorts black men delivers the advanced support required to conquer the rigors of triathlon. SBR Power is built to control muscle stabilization and support your lower body for unmatched power and durability, while our exclusive LD Chamois provides essential cushioning for the ride, but a discreet feel on the run. Sensor Mesh X zoned paneling delivers vital moisture management and air ow management, affirming that this garment is built for all-round performance across short and long course racing. Completely redesigned in accordance with 2XU’s latest RMIT University research, the 2XU Compression tri shorts black/white men promises superior ventilation and power. PWX 105D Power Mesh fabrication with muscle mapping ensures muscle stabilization for greater power output on the bike and the run, while muscle oscillation support reduces fatigue for greater endurance. 2XU's exclusive Pro LD Chamois provides essential cushioning for the ride, but a discreet feel on the run. 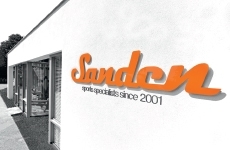 This range promotes endurance and provides protection against the challenges of long course racing; injury, fatigue, heat and the sun. Completely redesigned in accordance with 2XU’s latest RMIT University research, the 2XU Compression tri shorts black men promises superior ventilation and power. PWX 105D Power Mesh fabrication with muscle mapping ensures muscle stabilization for greater power output on the bike and the run, while muscle oscillation support reduces fatigue for greater endurance. 2XU's exclusive Pro LD Chamois provides essential cushioning for the ride, but a discreet feel on the run. This range promotes endurance and provides protection against the challenges of long course racing; injury, fatigue, heat and the sun. The Sailfish Tri short team black women is made from comfortable, soft Smooth Skin material for durable and comfortable fit. Lined and covered front-lock zip for high wearing comfort and comfortable fit at throat and neck. Lateral Air Stream mesh inserts for good breathability and ventilation. Reduced flatlock seams. 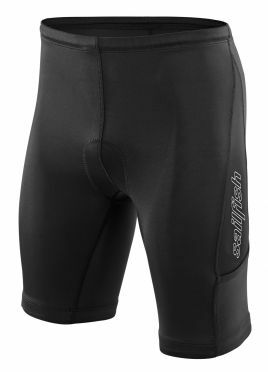 The Sailfish Tri short team black men is made from comfortable, soft Smooth Skin material for durable and comfortable fit. Lined and covered front-lock zip for high wearing comfort and comfortable fit at throat and neck. Lateral Air Stream mesh inserts for good breathability and ventilation. Reduced flatlock seams. The Sailfish Competition tri short black women combines a high-quality perforated pad made of fast-drying antibacterial microfiber, a new elastic logo-hem with woven-in silicone and flat seams to maximize comfort. The spacious back pocket and the two mesh leg pockets let you access energy packs quickly and easily, while an adjustable inner band for men and a flat waistband for women ensure an ideal fit for every body type. Paired with the sailfish Tritop or the sailfish Tribra Comp, you get a flexible duo that is ideal for longer distances. The Sailfish Competition tri short black men combines a high-quality perforated pad made of fast-drying antibacterial microfiber, a new elastic logo-hem with woven-in silicone and flat seams to maximize comfort. The spacious back pocket and the two mesh leg pockets let you access energy packs quickly and easily, while an adjustable inner band for men and a flat waistband for women ensure an ideal fit for every body type. Paired with the sailfish Tritop or the sailfish Tribra Comp, you get a flexible duo that is ideal for longer distances. The Orca Core tri short black/green women is designed with high-quality Italian eco-friendly fabrics, made from recycled nylon. Constructed of Orca's AquaStretch fabric for an incredible breathability. The 6mm tech chamois is a hybrid triathlon pad that provides additional padding and protection on the bike without getting in the way for the run and has been engineered to be fast drying. The Short has a secure covered pocket across the back for storing nutrition, comfortable elasticated hems and a rubber waistband. Matched with the Core Tri Tank, the Tri short can be used across short and long distance racing and training. 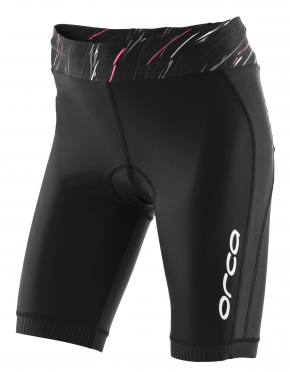 The Orca Core tri short black/white women is designed with high-quality Italian eco-friendly fabrics, made from recycled nylon. Constructed of Orca's AquaStretch fabric for an incredible breathability. The 6mm tech chamois is a hybrid triathlon pad that provides additional padding and protection on the bike without getting in the way for the run and has been engineered to be fast drying. The Short has a secure covered pocket across the back for storing nutrition, comfortable elasticated hems and a rubber waistband. Matched with the Core Tri Tank, the Tri short can be used across short and long distance racing and training. 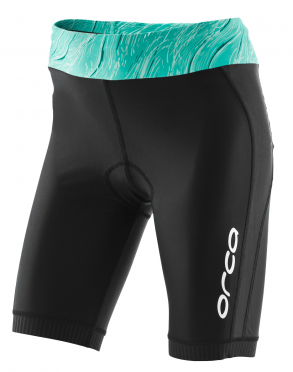 Made with Stretchskin technology, the Orca 226 Perform tri short blue/green women offers better aerodynamics and muscular compression. These shorts have innovative new features such as a new adjustment system, laser cutting and thermo-sealing, which allows them to fit perfectly to your legs, while their elastic grip keeps the shorts in place throughout the entire race. Designed with the Italian-made Tri-Tech chamois, you will feel more comfortable on your bike, without limiting your movement, so that you can run freely. These include back pockets where you can keep any food you need. The racing shorts you've been waiting for.